This is Meridian’s third annual white paper on trends impacting the banking industry (see our 2014-2015 and 2013-2014 white papers). Our paper represents data from Meridian’s review of 2015 proxies for U.S. banks with assets between approximately $10 billion and $400 billion. This perspective was selected as representative of the group of banks already on the front line of regulator and shareholder scrutiny. Trends faced by these banks provide an indication of the emerging themes and changes likely to cascade down to the broader banking industry. It is important to realize that bank compensation has and will continue to evolve. Regulators will continue to push their agenda, and we still await final regulations from the Dodd-Frank Act. Meanwhile, shareholders will continue to demand variability in pay that aligns with performance results. We look forward to continuing to monitor these evolving trends. If you have questions on any of the data/topics discussed, please do not hesitate to contact one of our team members listed above who will be happy to help. Nearly a decade after the financial crisis, bank compensation programs continue to evolve. Banks have needed to balance shareholder pressures to align pay and performance against regulators’ push to mitigate the potential for excessive risk taking. 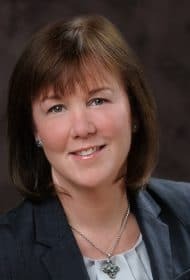 During this period, the industry has spent significant time and resources to adapt to these external influences, resulting in significant changes in executive pay programs and practices. Yet more change looms in the not too distant future. Regulators’ recently re-proposed rules under Section 956 of the Dodd Frank Act (incentive-based compensation arrangements) will undoubtedly change the structure and mix of pay for a significant number of employees at larger banks. At the same time, banks are pressured to embrace digital business models that represent new opportunities, but that also create new threats, a wider range of competitors and increased risks. With this backdrop, the industry faces increasing challenges to attract, retain and compensate talent. While banks have effectively balanced shareholder and regulator demands in recent years, we expect a more challenging period ahead. The business, regulatory and shareholder landscape will continue to pressure banks to change their compensation programs, policies and practices. 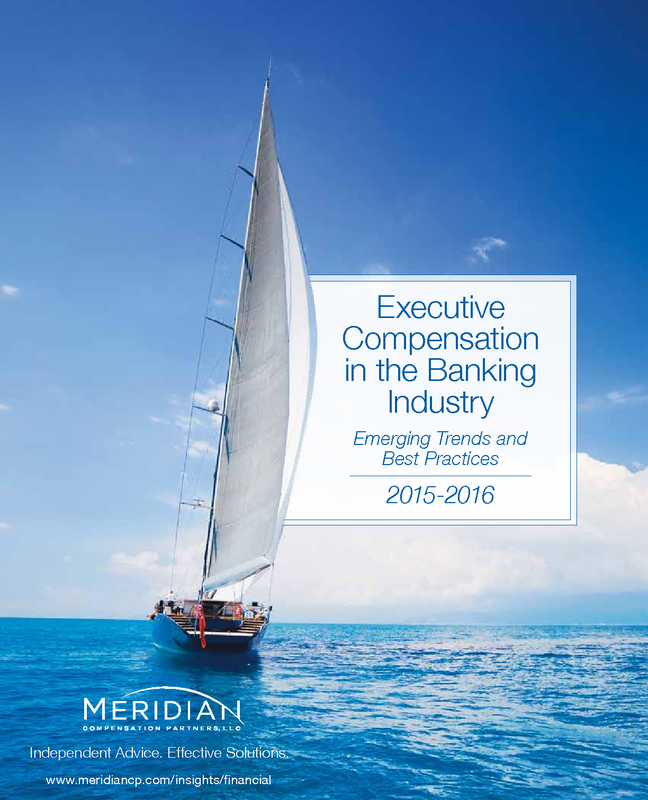 Meridian’s Banking Team has tracked compensation trends at the largest U.S. Banks for the last three years and will continue to monitor changes going forward. Our database includes all U.S. banks from $10 billion in assets to $400 billion in assets. Our goal is to monitor trends and assess the influence larger bank practices have on smaller banks. The remainder of this paper summarizes findings from our proxy database as well as our experience working with banks of all sizes across the U.S.
Public companies are subject to perspectives of shareholder and advisory firms like ISS and Glass Lewis, which is driving increased focus on aligning pay and performance. Bank regulators, on the other hand, have pressured the larger banks to adjust pay programs to ensure incentives don’t motivate excessive risk taking. 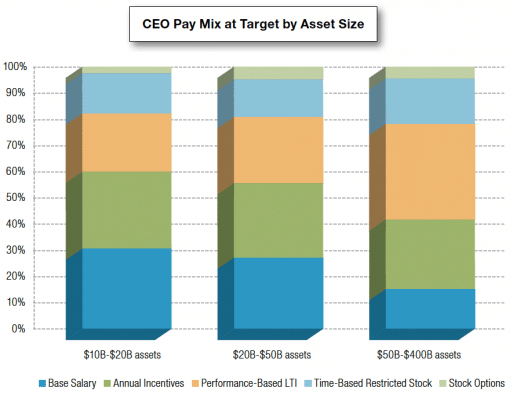 This has created meaningful differences in pay programs between different sizes of banks. Meridian divided the banks in our database into three classifications based on asset size, and assessed the incentive practices among the different groups of banks. Consistent with a pay-for-performance philosophy, the banks in our study provide the majority of executive compensation through incentive compensation. 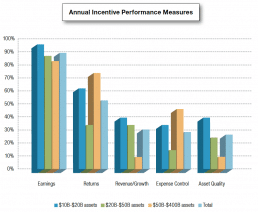 As expected, larger banks grant a much higher percentage of pay through incentives than smaller banks. While base salaries comprise just under one-third of pay at the smaller banks in our sample, they represent only 15% of pay at the largest banks. 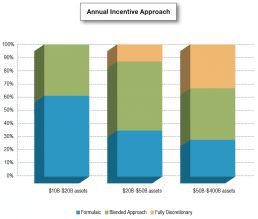 When considering incentive compensation, annual incentives comprised a similar percentage of total pay among all three size groupings (~30% of total pay). 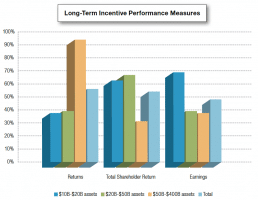 However, we found that the larger banks placed a greater focus on long-term incentives (~58% of total pay). This emphasis aligns with regulator expectations that a majority of incentives be paid over multiple years. 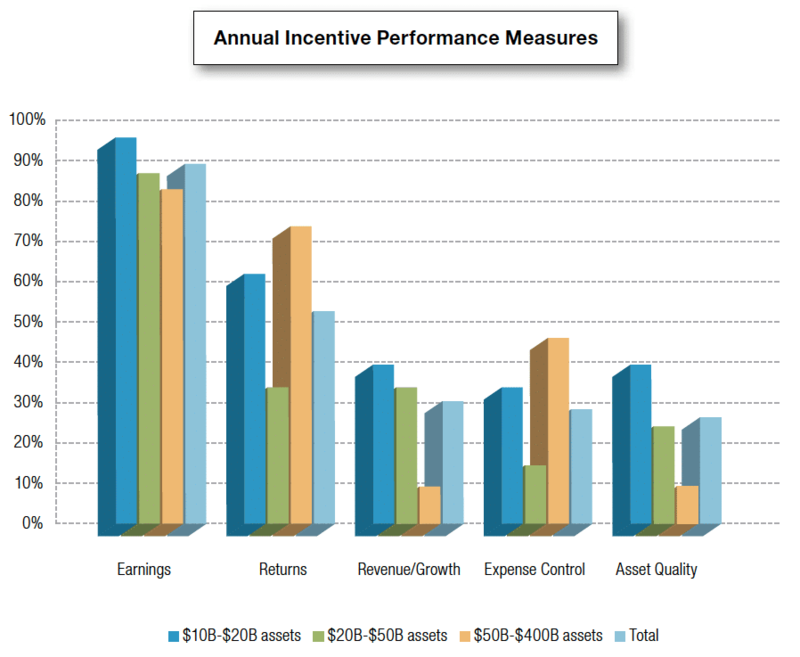 Within long-term incentive grants, the larger banks also placed greater weight on awards with performance vesting criteria (~60% of long-term awards). Annual incentive payouts can be based on a pre-established formula, a discretionary assessment of performance relative to expectations and/or peers, or through a blended approach that uses a formula but provides Compensation Committees with discretion to determine final awards. A majority of banks under $50 billion in assets use a formulaic approach, while the larger banks are more likely to use a discretionary or blended approach. Larger banks tend to use discretionary plans to allow them the ability to reflect a broader range of performance criteria, including strategic goals and risk criteria. However, discretionary plans are often criticized by shareholder advisory firms like ISS and Glass Lewis. Banks with formulaic plans prefer the more straight-forward nature of their plans and the direct link between results and payouts. Among banks with formulaic or blended approaches, earnings measures (e.g., EPS, Net Income) continue to be the most prevalent metrics assessed. Larger banks also tend to focus on returns (e.g., ROE, ROA) and expense measures like efficiency ratio, while the smaller banks are more likely to include growth measures (e.g., deposit and loan growth). Smaller banks are also more likely to include asset quality measures compared to larger banks that may include credit and risk as part of the discretionary process in a blended approach to determining payouts. Over 80% of the banks in our sample include performance vesting criteria on some or all of their long-term incentive grants. These awards are usually denominated in stock, with the final number of shares vesting based on performance over a 3-year period. Long-term performance plans primarily rely on formulaic goals based on one to three performance measures. Return measures are the most common type of measure in long-term incentive plans, particularly among larger banks. Return on equity and return on tangible equity are most common among larger banks, while return on assets is more prevalent among smaller banks. Total shareholder return, which is the most common long-term measure in general industry, is the second most common metric among banks and is less common among the larger banks. Earnings measures, particularly EPS, are more common among smaller banks. More than 70% of long-term plans determine payouts at least in part based on performance relative to a peer group of other banks. Beyond performance-based long-term incentives, restricted stock vesting based solely on continued service remains a common component. More than 70% of banks grant time-based restricted stock, and on average it represents approximately one-third of total long-term incentive awards. Time-based restricted stock can play an important role in enhancing the retentive aspects of the compensation program while maintaining alignment with long-term shareholder value. Stock options are less prevalent and typically represent a smaller component of pay. Stock options have declined in prevalence as regulators have expressed concern with their risk profile. Time-based restricted stock and stock options typically vest over 3 to 4 years on a pro-rata basis. The impact of regulators on banking industry pay practices can be seen clearly in the leverage within incentive plans. Regulators view incentives that provide the opportunity to earn payouts well above target as potentially promoting excessive risk taking. While other industries commonly provide the opportunity for payouts of two times the target amount, incentive plans in the banking industry typically provide lower upside. The larger banks have the most significant reduction in the upside opportunities in response to pressure from regulators. Proposed regulations seek to reduce the leverage for senior executive officers at the largest banks to 125% of target. While aligning pay with performance continues to be the key objective of executive compensation programs, increased focus on governance and risk mitigation related policies has also emerged as a critical component of sound program design. These policies and provisions are intended to reduce compensation-related risk, encourage a long-term perspective, and align executives with shareholder interests. Shareholders, proxy advisory firms and regulators want executives to own stock, and maintain stock ownership, to create alignment with shareholders. Ownership guidelines require executives to maintain a certain amount of equity ownership in the company (either a number of shares or dollar value). Post-vesting holding requirements prevent executives from selling stock earned from equity awards or option exercises for a period of time after vesting or exercise. As shown in the graphs above, stock ownership guidelines can be found at a significant majority of banks. On the other hand, post-vesting stock holding is more common at the larger banks. Prevalence for these two provisions has been largely unchanged in the last two years. In addition to owning and holding stock, many companies also put limits on what executives can do with the company stock that they own. Anti-hedging policies prevent executives from participating in transactions that protect against or offset any decrease in the market value of company stock. Pledging policies either completely prohibit or limit executives’ ability to pledge company shares as collateral for loans. Over 90% of banks in the Meridian study have anti-hedging policies and ~70% have a pledging policy (52% prohibit pledging and 20% limit pledging). While any hedging activity automatically results in a negative vote recommendation from ISS, there must be “significant” levels of pledging to raise an issue with ISS. Furthermore, the SEC’s rule on hedging disclosure, as proposed, will require public companies to disclose whether they allow any of their employees to hedge company stock. The current rules on pledging only require disclosure if executives or directors have actually pledged shares. Clawback policies and forfeiture provisions allow companies to recoup or adjust incentive plan payouts based on consideration of a variety of factors, including the impact of risk. Clawback policies allow the recovery of incentive compensation that has already been paid or vested when there has been a financial restatement and/or significant misconduct. On the other hand, forfeiture provisions provide for the reduction of incentive payouts and/or unvested awards prior to payment. Forfeitures are typically based on negative risk outcomes such as negative earnings, significant decline in capital levels, or a lack of compliance with risk policies. Clawback provisions have become common practice, due to regulatory pressures and pending Dodd-Frank rules. Forfeiture provisions to-date reflect a growing practice at banks larger than $50 billion in assets. Under its Dodd-Frank mandate, the SEC has issued proposed clawback rules covering all public companies. As these mandated clawback policies begin to take effect, we may see an increase in post-vesting holding requirements as companies try to decrease the potential burden of clawing back compensation that has already been paid. With several proposed Dodd-Frank rules pending final implementation (clawback, hedging policy disclosure, pay for performance disclosure and incentive risk), practices will continue to evolve. While some of the incentive risk policies focus on the largest banks, many are expected to cascade throughout the industry. 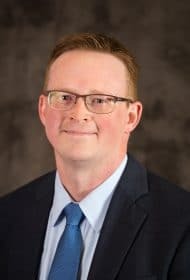 While compensation levels, design and policies will continue to be influenced by shareholders, proxy advisory firms and the SEC, the biggest influence on bank compensation in the next few years will most likely come from the recently re-proposed rules on incentive-based compensation under Dodd-Frank. All banks with over $1 billion in assets must include non-financial performance measures in their incentive plans that can override financial measures when appropriate. As many smaller banks currently use formulaic annual incentive plans based on financial measures, many will need to adapt their plans to allow for non-financial measures to override financial results. We may also see a shift in how banks use relative performance measures. For banks with assets above $50 billion, the proposed rules prohibit the use of a relative performance measure as the sole measure in an incentive plan. Relative performance measures have become more common for long-term incentive plans in recent years as banks struggle to set multi-year absolute financial goals given the uncertain economic environment. Although more than 70% of banks use relative measures in their long-term plans, not all of these are the sole measure used. Those that only use relative measures will need to add another measure(s) to their long-term incentive plan. Many larger banks have added absolute performance thresholds to their relative performance plans in an attempt to satisfy regulatory concerns. The re-proposed rules may also drive a shift in compensation mix due to the upside cap on incentive compensation. Depending on role, the maximum incentive payout would be capped at either 125% or 150% of target for banks with more than $50 billion in assets. Data from this study shows that banks have already reduced the upside opportunity on incentive plans in recent years, however not necessarily down to 125% or 150% of target. Banks may respond by increasing base salary, increasing incentive targets, eliminating incentive targets and/or shifting to fully discretionary plans. For banks above $50 billion in assets, the re-proposed rules also prohibit hedging, extend the current clawback period beyond the SEC’s proposed rule for all public companies, and require deferrals and forfeiture provisions. As illustrated above, these policies are most prevalent at the largest banks but still not universal. Some banks will need to adopt and/or modify risk-mitigation policies to ensure full compliance. Whether from shareholder feedback, regulator influence or competitive pressure, one thing is clear – the industry and its compensation programs will continue to evolve and will look very different in the next 5 to 10 years. Section 956 of the Dodd-Frank Act, once finalized, will challenge banks of all sizes to adjust their incentive programs, governance practices and approach to pay. Compensation Committees will have an increased role to ensure incentive programs use pay-performance alignment while also mitigating risk and complying with increased regulations. Meridian will continue to monitor practices of the larger banks and report on their impact as they likely cascade throughout the industry. Please let us know if you are interested in any custom cuts of our 2016 proxy database. Contact Susan O’Donnell at 781-591-5284 or sodonnell@meridiancp.com.